Ford has unveiled its 2020 Explorer. 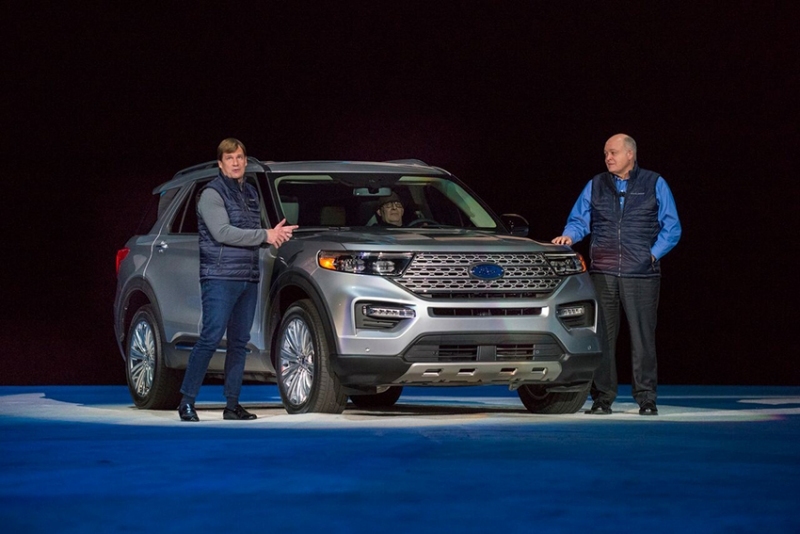 // Photograph Courtesy of Ford Motor Co.
Ford Motor Co. Wednesday introduced its all-new 2020 Explorer — a complete redesign of America’s best-selling SUV — that the automaker says now features more power, space, and smart technologies. The unveiling took place at Ford Field in downtown Detroit during a special reveal event for employees, fans, dealers, suppliers, government officials, and media. Ford’s new flexible rear-wheel-drive architecture makes the SUV more capable, comfortable, sportier, and roomier in all three rows, according to the manufacturer. Improved off-road capability comes courtesy of intelligent four-wheel drive and an available new Terrain Management System that features seven easy-to-engage drive modes. Powertrain offerings include a 3.0-liter turbocharged EcoBoost V6 projected to produce 365 horsepower and 380 lb.-ft. of torque using 93-octane gas, making this the most powerful Explorer ever, Ford says. The Explorer lineup now features standard, XLT, Limited, Limited Hybrid, ST and Platinum models. The all-new Explorer comes with more than a dozen new standard features for $400 more over the previous model. Standard features include a power liftgate, 2.3-liter EcoBoost engine with all-new 10-speed transmission, 8-inch digital touch screen with SYNC 3, FordPass Connect Wi-Fi service for up to 10 devices and more. The all-new Explorer is manufactured at Ford’s Chicago Assembly Plant, and are due in showrooms this summer.